The definition of identity politics remains elusive. Used as a catch-all term, often in a derisive manner, it has been blamed for the weakness of the modern “left”, the rise of the so called “alt-right” or the electoral victory of Donald Trump itself. Those “accused” of identity politics often point out the racist, sexist or class reductionist attitudes of those “united” under the anti-identity banner. This is the context in which Asad Haider, “left wing academic” and member of the Student-Workers Union at the University of California, wrote Mistaken Identity: Race and Class in the Age of Trump. The primary reason why this particular book is worth reviewing, among many others covering the same theme, is that Haider also happens to be the founding editor of Viewpoint Magazine. This magazine, in its own words, aims to “reinvent Marxism for our time”, often drawing on autonomist and feminist sources of the past. Haider approached the writing of this book from the perspective of someone who believes in “the project of universal emancipation, of a global, revolutionary solidarity [that] can only be realized through organization and action”. As such, it stands to reason that the book should be of interest for those seeking revolutionary perspectives regarding the question of identity today. But does it provide any answers? Despite seemingly setting out to criticise identity politics, Haider’s attitude towards identity politics is never quite clear. At one point he states that “we have to reject ‘identity’ as a foundation for thinking about identity politics” and that identity politics appropriates “[emancipatory legacies] in service of the advancement of political and economic elites” . But then at another point he seems to make the case that identity politics has been usurped from its radical origin by the likes of Hillary Clinton, Barack Obama and Bill Cosby, that instead he wants to root his analysis in the experience of the likes of Combahee River Collective, Malcolm X and Huey Newton (and it is never clear if for Haider these groups/individuals belong in the identity politics camp or not). And so it goes, never really providing a coherent framework for grasping what identity politics really is or what is really wrong with it (the scattered blog-like nature of the book does not help). The trappings of identity politics are actually evident from the very first pages as Haider begins by outlining his identity as a kid born in the United States to Pakistani parents and the trials and tribulations his identity, often externally determined, put him through. He for the most part side-steps the question of gender (instead recommending the reader have a look at Judith Butler’s Gender Trouble), because his own personal identity formation was primarily racial than gendered. From then on he makes multiple references to his “own personal experience” all throughout the book (because, as we are led to believe, rooting politics in your own experience is most radical), to the point where one might confuse it for an autobiography. That is not to say that there is nothing to learn from or relate to in his recollections of his youth radicalisation, the 2003 Iraq protests, the 2011 Occupy movement, the 2014 Ferguson uprising and the Black Lives Matter movement, or the various student protests and occupations he took part in. But it is unfortunate that at every step it feels like the author is trying to justify his critique of identity politics through his own identity and experiences. Mistaken Identity is a constant stream of quotes and references. Haider attempts to critically understand and problematise terms like identity politics, white privilege and intersectionality. The chapters where he discusses the complexities of race and slavery, and the changing composition of the working class, while not original, provide some basic materialist analysis. But he never extends the same kind of analytic thinking to anti-imperialism, mass partyism and national liberation, nor to the roots of these terms which are simply taken for granted. Tracing the history of identity politics to the residues of the New Left, Haider instead harkens back to the “good old days” of 1930s community organising as exemplified by the Communist Party USA (CPUSA) and the heights of the Civil Rights Movement, which according to him constituted “the closest US equivalent to the mass workers’ movements in postwar Europe”. He mourns the way left wing discourse has been reduced to the policing of personal identity instead of having a link to a popular will. This is where the problem lies. Most of Haider’s reference points belong firmly in the camp of Stalinism and Maoism. The CPUSA, the CPGB, the New Communist Movement (POC, the Black Panthers , etc.). This is to the degree that he completely omits cross-racial organising by the likes of the IWW (the first major industrial organisation in the USA to make an effort to organise black workers). He does not criticise Stalinism or Maoism, the fact that they linked the fate of the working class movement with the survival of the Russian and Chinese states, that they trapped workers into the dead-ends of trade unionism, parliamentary politics or adventurism. Haider keeps referring to “progressive nationalism”, “anti-revisionism”, “black self-determination” etc. without much critical engagement. Sure, in the abstract one can admire and take lessons from the organising capabilities of organisations from across the political spectrum (even reactionary groups like Hezbollah etc.). But there remains the question of means and ends. Why did Stalinism and nationalist groups require mass movements and where did it lead these movements to? This cannot be brushed aside. We have to openly question the counter-revolutionary legacy of Stalinism and national liberation struggles otherwise we are bound to repeat their errors ad nauseam. In these passages Haider finally does criticise the premise of “revolutionary nationalism”. But he does not link it to the ideologies of Stalinism and Maoism. Indeed, the terms Stalinism and Maoism do not appear a single time in the whole book! So we are forced to ask the question – is this a subtle attempt to rehabilitate the ideas of Stalinists? Does Haider’s attempts to reclaim Althusser elsewhere confirm a pattern? Regarding the CPUSA, Haider sees its failure in the “complicated history of political disputes within [it], along with the state repression of the Communist movement”. “Political disputes” is putting it lightly: we are talking here of the counter-revolution in Russia, the mass murder of revolutionaries carried out by its state apparatus, and the total submission of the international communist parties to the will of the Russian state…. In Mistaken Identity there is no recognition that in the 1920s “the transformation of cadre parties into mass parties was not a result of a different tactical approach [but a] change in strategic objective”, that with the prospect of international revolution declining, it was adopted by the Third International “in order to create a sort of security zone around Russia”. There is no recognition that today national liberation or so called anti-imperialism is “the policy of subordination of the proletarian political forces to the national bourgeoisie”, and that historically it has “led to the massacre of tens of thousands of workers by the national bourgeoisie, the destruction of workers organisations and the extinction of revolutionary struggle”. For Haider, mass partyism, national liberation and anti-imperialism constitute guiding principles, next to the likes of internationalism and opposition to oppression. There is no understanding of how they work directly counter to the independence and self-organisation of the struggle of the working class (which after all Haider also claims to stand for). In the end, identity politics (both its pro and anti wings) is just the latest trend in bourgeois discourse. Dodgy ideologies are being smuggled under both wings, and in the case of Haider and his “anti-racist” and “universalist” alternative, however well meaning, we are also being sold subtle Stalinist nostalgia. 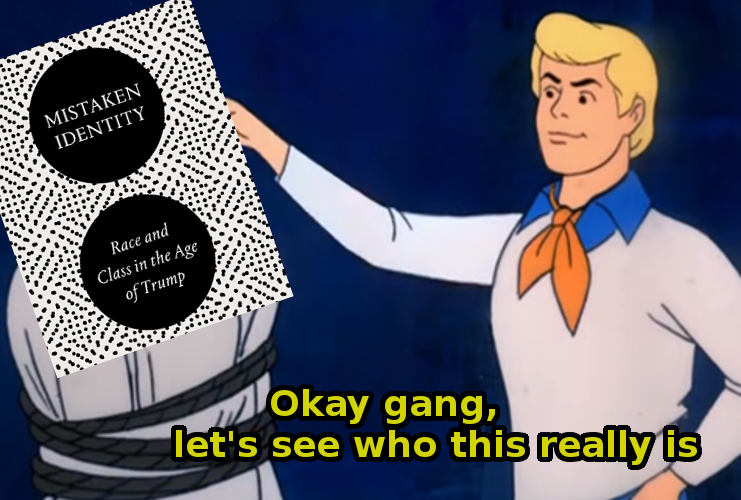 The central thesis of Mistaken Identity is that “our identities are not foundations for anything; they are unstable, they are multifarious”, that “we have to find ways to become comfortable with that, and part of how we can do that is by creating new ways of relating to each other, which can come through mass movements”. It is true that through common struggle workers of all identities can find a common ground. But that is not enough. What we need is also a real sense of class independence and self-organisation, the meaning of which this book obscures. What we need is a shared vision of a world without capital and profits, based on direct democracy, where production is for need. And to that end – an organisation with a coherent vision of a new society and how to get there. Admittedly, the tiny groups of the communist left that exist today have found this difficult to do.